Over the years, polycarbonate (Lexan) has been installed in religious edifices, covering the beautiful architectural details of these historic buildings and reducing the light infiltration through the stained glass. This material yellows over a period of years, and if not vented properly, could cause wood rot and lead oxidation. 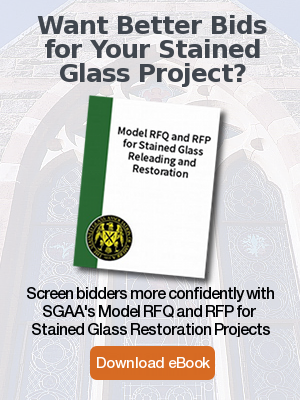 A survey by Rohlf’s Studio can be extremely important to both insure the stability of the stained glass and the wood frames. Should the window frames be in a repairable condition, the framing can be scraped or stripped, epoxy repaired, primed and painted with two coats of an exterior semi gloss paint. 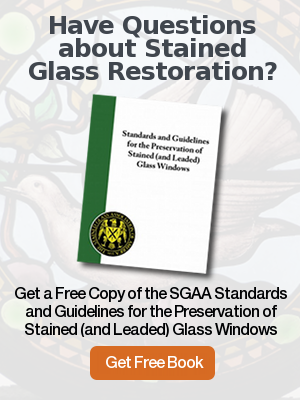 Wood window frame, sill or sash replication may be an option during the restoration of stained or leaded glass windows. After Rohlf’s Studio has completed a project survey, it may be determined that some wood components or the entire wood window frame assembly is beyond restoration. Rohlf’s Studio can replicate wood window frame components, sashes, sills or entire wood frame assemblies while scrupulously maintaining the integrity and appearance of historic buildings. Rohlf’s Studio only uses the finest Mahogany or Spanish Cedar available & we engineer each system to withstand the proper wind loads. Wood window frames are also available in double or single glazed which maintains the historic replication while offering maximum energy efficiency & durability. Rohlf’s Studio integrates proven traditional techniques with the best modern practices, along with their trademark craftsmanship and painstaking attention to detail to meet the most stringent standards for historic preservation of stained or leaded glass windows.